Come to Holizaar and meet Cindy of Devine Designs Jewelry! She has been participating in Holizzar for several years and always brings wonderful work with her. "I try to take metal to the extreme; by bending and twisting to create unique designs. 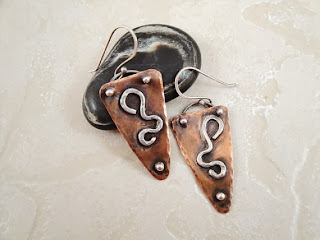 I use lots of wire to make twists, coils, and spirals that I add to my work. I strive to form designs that have not been done before, original works of art jewelry. I strive for perfection and high quality. What you will find here: I only use high quality components in my jewelry such as: sterling silver, high grade Thai silver, pure copper, gemstones and artisan made glass beads. What you will not find here: I do not mass produce, or use cookie cutter concepts when I create a piece. I do not use cheaply made components. My goal is to constantly learn new techniques that I can offer the customer and to grow as an artist." Cindy has beautiful work! I love her new rings!